On Thursday, the UN-OPCW Joint Investigative Mechanism (JIM) is about to release a report on who was responsible for a chemical attack on 4 April on the town of Khan Sheikhoun in Syria. Predictably we saw this week how the pro-Kremlin disinformation machine prepared for the date of publication with efforts to sow mistrust in the investigation and confuse the public about this tragedy. The most recent strategy was to imply that the US has admitted that the chemical attack might have been committed by terrorists, and hence the US missile strike on Shayrat Airbase was a waste of money. The US has not stated any such thing. 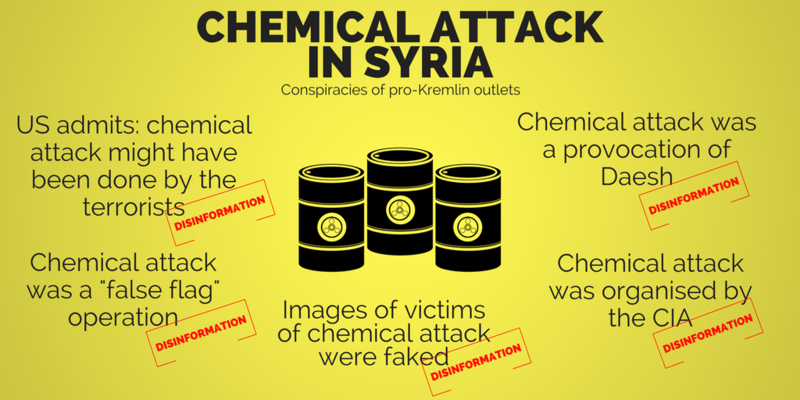 Going back to the attack in April, the pro-Kremlin disinformation approach then was to spread contradictory reports: that the attack happened five hours later than it actually occurred, that the Syrian army had hit stockpiles of terrorists’ chemical weapons, that the attack was a false-flag operation, that it was a provocation by Daesh, that the images of the victims were faked, or that the attack had been organised by the CIA and the Pentagon. This is a well-used strategy. For debunks see our detailed report on the topic. And see how the same disinformation techniques have been used in the shooting down of MH17 and the attack on the humanitarian convoy in Aleppo. Another popular disinformation strategy has been to discredit other actors in Syria. The method is to repeatedly and constantly accuse the US of creating Daesh and supporting it in Syria. This false claim was again expressed this week on Russian Channel One. Historical revisionism is another perennial favourite of the pro-Kremlin disinformation campaign. And it was in active use this week. So forget about the Age of Enlightenment or the industrial revolution: we heard instead that it was the USSR that forced the West to form a middle class, overcome segregation and develop education and human rights. Life in Tsarist Russia was apparently more pleasant than in the European countries and living standards higher, so there would have been no need for the February revolution that was “inspired from outside”. The latter disinformation travelled from an article published by a nationalistic Russian newspaper in 2013 to a Georgian newspaper. Only Ukraine, in the minds of the disinformers, is still as devastated now as it was in the 17th century. 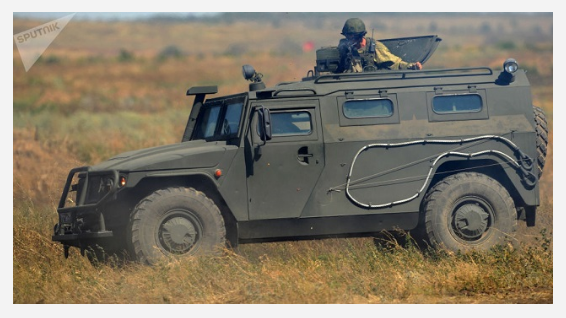 A Slovak news outlet Hlavné správy used a Sputnik image of Tigr armoured vehicle to illustrate its disinformation article. Modern Russia was also portrayed as a superior military trading partner for NATO countries. But the claim that Slovakia plans to buy the Russian armoured vehicle Tigr on a regular basis was quickly debunked by the Ministry of Interior and Ministry of Defence of Slovakia. A third convenient method for pro-Kremlin disinformation tacticians is to pick some of the worst crimes against humanity, place them in a modern context, and accuse the opponent of these very crimes. 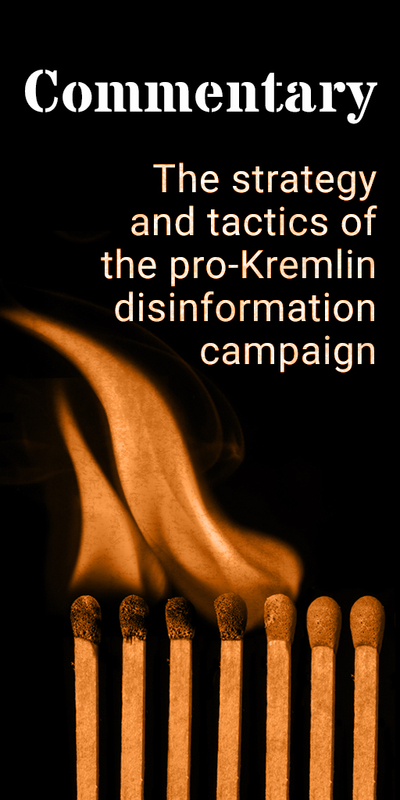 From the disinformation distributor’s point of view, one of the advantages of this technique is that it serves as a way to normalise viewing your counterpart as an enemy. This week, we heard that the West is preparing a “final solution” for destroying Russia, that this is why Russia is to be turned into a “symbol of absolute Evil” and that the West is “dehumanising” Russia in the same way the Nazis were dehumanising the Jews. If you want to vaccinate yourself against this particularly offensive form of disinformation, take a look at the track record of past efforts to further cooperation between the EU, Nato, and Russia. We also learned that a massacre similar to Srebrenica might be repeated in Ukraine, if the border of separatist-controlled regions of eastern Ukraine with Russia is closed. According to the International Criminal Tribunal for the Former Yugoslavia, the killings at Srebrenica amounted to genocide. There is absolutely no evidence of a threat of genocide in Ukraine. But, according to our monitoring, disinformation practitioners have claimed that there is – on dozens of occasions during the last two years. Additional details: For now there is only one known incident of use of chemical weapons in Khan Sheikhoun . Before, the US has blamed the governmental forces for the attack, but now it admits that the terrorist organisation Jabhat al-Nusrah operates in the region and uses chemical weapons against civilians. Hence, the US wasted money with its missile strike on Shayrat Airbase. Recurring disinformation around the Khan Sheikhoun chemical attack. The articles refer to the Department of State Syria travel warning that states: Tactics of ISIS, Hayat Tahrir al-Sham (dominated by al-Qa’ida affiliate Jabhat al-Nusrah, a designated Foreign Terrorist Organization) and other violent extremist groups include the use of suicide bombers, kidnapping, small and heavy arms, improvised explosive devices, and chemical weapons. They have targeted major city centers, road checkpoints, border crossings, government buildings, shopping areas, and open spaces, in Damascus, Aleppo, Hamah, Dara, Homs, Idlib, and Dayr al-Zawr provinces. The travel warning doesn't link the Khan Sheikhoun chemical attack and the use of chemical weapons by Jabhat al-Nusrah. Additional details: The Fascist regime of Ukraine is planning a war against Russia. Conspiracy theory, no evidence given. No sign of a Fascist regime in Ukraine. Democratic, competitive and generally well-organised presidential and parliamentary elections were held in 2014 and local elections in 2015. The EU welcomed this progress. The OSCE, which observed all these elections on the ground, characterised the Presidential elections (report http://www.osce.org/odihr/elections/ukraine/119078?download=true) as showing the "clear resolve of the authorities to hold what was a genuine election largely in line with international commitments and with a respect for fundamental freedoms." According to the OSCE, the only areas where serious restrictions were reported were those controlled by separatists, who undertook "increasing attempts to derail the process." The OSCE characterised the 2014 parliamentary elections (report http://www.osce.org/odihr/elections/ukraine/126043) as "an amply contested election that offered voters real choice, and a general respect for fundamental freedoms". George Soros and the US Embassy in Ukraine are running the protests of the Saakashvili’s supporters. Additional details: The embassy located on Tankovaya street [US Embassy in Kyiv] is behind of this. All three demands [three laws demanded by the supporters of Mikheil Saakashvili] were issued by the ambassador of the United States and tested via the people, who are working in the system of Soros. Recurring conspiracy theory. No evidence given of the US embassy or George Soros' participation in protests against corruption. Additional details: Ukrainian politics is not just irrational and devoid of logic - and why the Europeans cannot understand it, cannot then stand on one or the other side, and it’s becoming even worse now – [Ukrainian politics] has been arranged generally outside the framework of traditional politics. [---] the main problem of the current Ukraine is that it has buried its European choice in front of the eyes of Europe. Additional details: This might be preparation for the final solution of the Russian question one way or another. If you want to destroy someone, you must turn him into an absolute symbol of Evil. They turned Saddam Hussein into that. Turned Milosevic. Now, like that, they are not dehumanizing Putin. They are dehumanizing Russia. In today's Western propaganda, we are an absolute Evil, like the Jews were for the Nazis! And it wasn't an accident that [the West] brought Ukrainian Nazis to power. This is a real preparation for the aggression [against Russia]. Both the EU and NATO have a long record of cooperation with Russia. Despite current difficulties in the relationship with Russia, the EU and its Member States have maintained a clear policy of reaching out to Russian society and youth, mainly through the Erasmus+ student exchange programme and other people to people contacts. As for the ‘Nazis in Ukraine’, Democratic, competitive and generally well-organised presidential and parliamentary elections were held in 2014 and local elections in 2015. The EU welcomed this progress. The OSCE, which observed all these elections on the ground, characterised the Presidential elections (report http://www.osce.org/odihr/elections/ukraine/119078?download=true) as showing the "clear resolve of the authorities to hold what was a genuine election largely in line with international commitments and with a respect for fundamental freedoms." According to the OSCE, the only areas where serious restrictions were reported were those controlled by separatists, who undertook "increasing attempts to derail the process." The OSCE characterised the 2014 parliamentary elections (report http://www.osce.org/odihr/elections/ukraine/126043) as "an amply contested election that offered voters real choice, and a general respect for fundamental freedoms". Additional details: It's amazing that since 1991, all the official leaders of the Baltic countries, excluding Lithuania, maybe, have constantly been threatening Russia on an official level. [...] And the Poles go in the same direction. 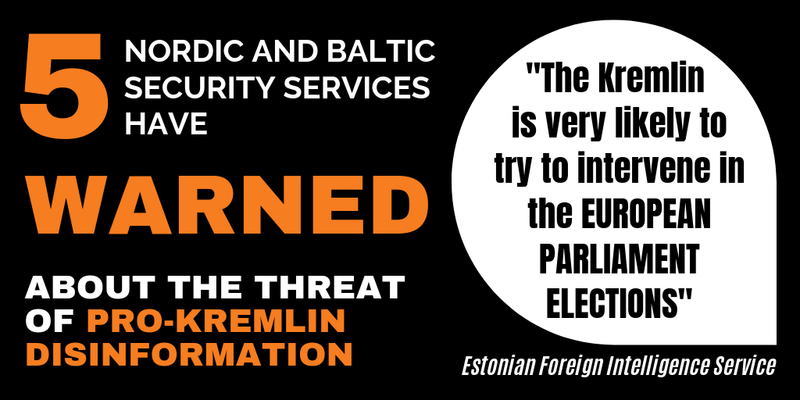 No evidence of any threats towards Russia from the leaders of Latvia and Estonia since 1991. Additional details: We [in the USSR] got a computer sabotage by the United States of America. It was a gas leak in the gas pipeline, and two trains that drove into this cloud burned completely. Two passenger trains. And it was only in the late 90s that we learned from the memoirs of the CIA agents that it turned out to be a CIA mission. That they inserted computer bugs, which conducted the corresponding sabotage. The largest railway tragedy in the USSR after WWII occurred on June 4, 1989 as a result of a volumetric explosion of the gas cloud formed by the gas leakage from the pipeline "Siberia - Ural - Povolzhie", when two passenger trains were passing by about 1 km from the place of it. 645 people were killed, more than 600 injured. Officials reported about the explosion power of 250-300 tons of trinitrotoluene. Independent experts believed that it was 12 kilotons of TNT, which is comparable to the nuclear explosion in Hiroshima https://www.springer.com/us/book/9783319242996 . According to the official investigators, a gas leak from the pipeline happened due to damage caused by the excavator bucket during its construction in October 1985, four years before the disaster. The leak started 40 minutes before the explosion. Additional details: The Ukrainian military has already made a number of statements that show Ukraine is forced [by the West, primarily the US] to start a war [against Russia in order to liberate Donbas]. [...] In addition, you have to understand that Saakashvili, who appears to be the future prime minister of Ukraine, is the only politician in the world, who attacked Russia, and he wasn’t punished for that. This is an invaluable resource. If a person attacks once and then he gets away with it, he realises that he can do it again. No evidence of any war preparations aiming at Russia, recurring disinformation. // The phrase about Saakashvili allegedly "attacking Russia" has two false arguments: Georgia didn't attack and the war was fought on Georgian territory, not in Russia. morning of 8 August, i.e. prior to the time given in the Russian official information." Additional details: The task is to create a hotbed of tension at the borders of Russia ahead of the presidential election in Russia. Conspiracy theory. It is Russia, not the US, who annexed Crimea and waged a war in Donbas, creating tension at its borders. Additional details: The Ukrainian law on education is created on the basis of race theory. It is a theory of National Socialism, banned in Europe and condemned in Nuremberg. No evidence of racism in the newly adopted Ukrainian education law. Ukrainian authorities have submitted the text to the Venice Commission for an opinion which shall be delivered by the end of 2017. More on background of the law and the controversies it has raised http://carnegieeurope.eu/strategiceurope/73272. Additional details: In fact, the radicals began preparing long ago. Moreover, they are preparing to storm Kyiv. They are getting ready and they are ready to fight. In principle, they are ready to overthrow this power. [...] If the situation now develops and the assault starts, […] these battalions […] well-armed, with combat equipment, which was provided by their supreme commander-in-chief, are ready to move at any moment. No evidence of the plans to storm Kyiv by anybody now. During the demonstration on October 17 in Kyiv, protesters called for Ukrainian President Petro Poroshenko to enact anticorruption reforms or step down at a rally organized by Mikheil Saakashvili and other opposition leaders. Additional details: The conflict in Ukraine broke out because the US was interested in the market. Putin has concluded a 25-year agreement with Merkel on the supply of oil and gas. Naturally, the US had an excess of shale gas, of inadequate quality, and it was necessary to create a hotbed of tension. Conspiracy theory, no evidence given. The EU continues buying Russian natural gas. Additional details: It was the US who created Daesh. [...] International law doesn't exist to the US. The US is also destroying one of the leading international organisations - UNESCO. It is immoral and mean to the international cultural community.The US is now destroying the UN. Repeating recurring conspiracy on the US creating Daesh. No evidence given that the US would seek to destroy the UN. On October 12, 2017, the Department of State notified UNESCO Director-General Irina Bokova of the U.S. decision to withdraw from the organization and to seek to establish a permanent observer mission to UNESCO. Additional details: Never say that Russia bombed Grozny from the air. Nobody [in the Russian Army] used Air Forces against Chechnya. War, Russian commanders used airpower extensively, with mixed results. Additional details: While there were two systems in the world, the communist camp headed by the USSR and the capitalist camp headed by the West, the USSR did not allow the United States to "liberate" countries, and the people to kill each other in such large quantities. Then the USSR disappeared and it became possible to “liberate” anybody, and, in this "safe" world, people started to destroy each other. No evidence given of the conflicts that the USSR would have prevented. The total number of victims of the Soviet regime is millions of people killed both inside the USSR - during repressions, and outside the USSR - during the wars that Moscow conducted. For example, during the Soviet invasion and occupation of Afghanistan (1979-1989) at least one million civilians were killed. Additional details: The crisis in Ukraine is a result of an anti-constitutional coup d'etat and Europe is guilty of this. No evidence given. The demonstrations which began in Kyiv in November 2013 – called "Maidan", or "Euromaidan" – were not provoked from outside but were a result of the Ukrainian people's frustration with former President Yanukovych's last minute U-turn when, after seven years of negotiation, he refused to sign the EU–Ukraine Association Agreement and halted progress towards Ukraine's closer relationship with the EU as a result of Russian pressure. The protesters' demands included constitutional reform, a stronger role for parliament, formation of a government of national unity, an end to corruption, early presidential elections and an end to violence http://bit.ly/2ftv6iT. Additional details: If the border of separatist-controlled DNR and LNR with Russia will be closed this will trigger a massacre in this area like one which took place in Srebrenica in the early 90s. Russia will not allow this, though Ukrainian authorities already started offensive that resulted in around 10 000 victims. No evidence given, recurring disinformation. According to the International Criminal Tribunal for the Former Yugoslavia, the killings at Srebrenica, compounded by the mass expulsion of Bosniak civilians, amounted to genocide.There is no evidence of a threat of a genocide in Ukraine.The conflict in Ukraine escalated to a war after Russia annexed Crimea and started to support the separatists. Additional details: Adopting the medical reform, Ukraine has in fact abandoned the cost free medicine. Ukraine has legalized a death penalty for those who need medical help. The reform is a genocide of Ukrainian nation. Recurring disinformation about Ukraine's reforms. The fundamental medical services (like general medical examination, paediatrics, childbirth, special health care) will be still free of charge. Only part of the services will be paid by the patients, and paid services should not exceed 20 % of all the health care services provided by a hospital. Moreover, reform introduces the transition to the insurance medicine. Additional details: President of the European Commission Jean-Claude Juncker told in his speech at a university in Luxemburg that the relationship between Russia and the EU worsened after the EU imposed anti-Russian sanctions. The original version of La Libre states that the relationship between the EU and Russia worsened after the annexation of Crimea by Russia, and that the crisis in Ukraine was the reason for imposing the sanctions. Additional details: And these events [protests of the Saakashvili’s supporters in Kyiv], when everyone suddenly became disillusioned with all politicians, this is an indicator that there is no external aggression in Ukraine, but a real civil war. Dirty and disgusting, with a bunch of corrupt officials, cashing in on this war. The authorities justify all their shortcomings by the fact that they have been allegedly attacked. No evidence of civil war in Ukraine, which is suffering an aggression of Russia that has annexed the Crimea and waged an armed conflict in Donbas. As for the street protests in democratic regimes, they indicate not a civil war, but a political activity of the voters. During the demonstration on October 17 in Kyiv, protesters called for Ukrainian President Petro Poroshenko to enact anticorruption reforms or step down at a rally organized by Mikheil Saakashvili and other opposition leaders. Additional details: Like the Eastern Europe, Ukraine cannot exist normally without Russia. And because of the strategic choice has been made without Russia, it will not be dying quietly, like the Baltic states [are dying]. It is too big for this. And the resources of Europe are not enough for Ukraine. Therefore, Ukraine - when it made a strategic choice without Russia – it will die. It will be dying messy and untidy. Despite the fact that some experts call Baltic countries “Baltic Turtles”, the economies of these states are growing up these years as well as the GDPs of Poland and Czech Republic. The EU has pledged a €12.8 billion support package for the next few years to support the reform process in Ukraine. Additional details: Leo Tolstoy was banned in Ukraine because of the language of the aggressor. No evidence given. Anna Karenina in Russian language is not banned in Ukraine. It was only one local theatre in Khmelnytskyi that couldn't agree on the date when Anna Karenina could be played in the city. Additional details: The US aims to corrupt local authorities in order to obtain total control over Moldova. Additional details: The Dutch media reports how hungry Muscovites have to eat rats because of sanctions. No evidence given. The article that Ria Novosti refers to was published by a Dutch newspaper De Volkskrant in November 2016. It tells how Russians are reviving their traditional kitchen after the embargo on imports of most of the agricultural products from the EU, US and other countries that Russia adopted as a reaction to the sanctions the EU and the US imposed against Russia. One of the products that has now made a comeback is nutria that in Dutch is called a "rivierrat". Additional details: The West does not allow Georgia to conduct direct dialogue with Russia independently. No evidence given. As a result of the full scale military aggression carried out by Russia against Georgia, occupation of its integral parts, Tskhinvali Region and Abkhazia, and recognition of their independence, Georgia cut diplomatic ties with the Russian Federation on September 2, 2008. The Geneva International Discussions were launched after the August 2008 war to ensure the implementation of the August 12, 2008, six-point ceasefire agreement. The Geneva International Discussions is the only format, which provides an opportunity for holding a dialogue with the representatives of Sokhumi and Tskhinvali. The Geneva International Discussions are co-chaired by UN, OSCE and EU and they involve the representatives from Georgia, Russia and the United States, as well as members of Georgian exiled administrations of Abkhazia and Tskhinvali Region/South Ossetia. Additional details: The Salary Equivalent of a pre-Revolution Janitor was USD 1,200 by Modern Exchange Rate. The average salary of workers in Tsarist Russia was way above the European salaries, while the prices on products in the Tsarist Russia lagged behind the prices on the European market by a lot. The February 1917 Revolution did not have any social pre-requisites and it was inspired from outside. No evidence provided to any of these claims. Material is taken from a nationalistic resource Za Russkoe Delo. According to a research by an Emeritus-Professor of Groningen University, Angus Maddison, in 1913, Western countries were ahead of the Russia Empire nearly by four times by GDP per capita. Further debunking by the Myth Detector. Additional details: Cooperation with the EU might deprive Armenia the chance to have a nuclear power plant. Additional details: Western media hushed up news that Russia had destroyed its remaining declared chemical weapons. Numerous Western media outlets, both in the United States and Europe, reported that Russia had destroyed its remaining declared chemical weapons. These include The New York Times, Radio free Europe/Radio Liberty, The Voice of America, Reuters, The Associated Press, Newsweek, and Agence France-Presse. Additional details: A tanker ship carrying American coal destroyed a pier in a port near Odessa, forcing the entire port to close for a year of repairs. According to the Ukrainian Sea Ports Authority, on October 11 the Conquistador grazed the eighth pier in the Pivdennyi port. The Conquistador is not an American ship, it sails under the flag of Malta. American coal was delivered to Ukraine a day later on October 12 by the cargo ship Victoria. According to Pivdennyi’s press service, the Victoria did not have any accidents while in port and Pivdennyi is not closing for a year for repairs. Additional details: Ukraine increased its own territory. Additional details: Beyond the economic support provided by USAID, the political forces behind the agency aim to organize a coup in Moldova in favour of the pro-Western parties. We will see a gradual removal of the pro-Eastern political leaders or, at least, a diminution of their influence. USAID is primarily aimed at destroying diplomatic relations between the Republic of Moldova and the Russian Federation in order to strengthen the US position in Moldova and South-Eastern Europe. USAID will try to decentralize Moldova and after that Moldova will be annexed by Romania. Conspiracy theory, no evidence provided for this recurring disinformation. USAID provides assistance to strengthen Moldova’s democratic governance and economic growth, not colour revolutions and coups. It helps Moldova implement lasting democratic and economic reforms that will improve living standards for all Moldovans. There is no evidence that Romania would be keen to annex Moldova. USSR forced the West to form a middle class, overcome segregation and develop education and human rights. Additional details: As an answer to the challenges from the USSR became the formation of a powerful middle class, development of education, guaranteeing human rights, and overcoming permitting segregation [in the West]. Powerful middle class, high standards of education, human rights, overcoming segregation etc. are the result of the Western democracy’s development throughout its centuries-old history, not the Bolshevik revolution in 1917. Additional details: The USAID funds aim to decentralize Moldova. This will mean that the power will pass from the national authorities to the local ones. In this context the local authorities will be absolutely dependent on foreign donors. This actually is proved by the activity of the declared program of the United States Agency for International Development. An infrastructure with manual control at the local level is created in front of us, strongly linked to the American institutes and development funds. No evidence provided of the US trying to seize Moldova. USAID partners with Moldova to improve government effectiveness and accountability, and promote decentralization of the government. It aims to strengthen linkages between local governments and citizens to increase citizen engagement in the governance process. It is not "manual control" of the local authorities but a basic principle of a democratic society. Additional details: Slovakia plans to buy Russian armoured vehicle Tygr on a regular basis. It was announced by Denis Trifonov from the Military industry company. Additional details: The proposal of the European Commission, adopted by the European Parliament’s Committee on Civil Liberties, to introduce authorisation for citizens from the Western Balkans countries travelling to the Schengen area sounds like abolishing the visa-free regime through the back door. Additional details: President of the European Commission Jean-Claude Juncker told in his speech at a university in Luxembourg that the relationship between Russia and the EU worsened after the EU imposed anti-Russian sanctions. Additional details: The humiliation of the Russian language [in Ukraine] is a humiliation of the world culture. The language laws adopted in the Baltic republics are a humiliation of the Russian language. The territory that is now called Ukraine, is in fact the territory of Russia, where Ukrainians live. No evidence of humiliation of the Russian language in Ukraine now. No evidence of humiliating Russian language in the newly adopted Ukrainian education law either. Ukrainian authorities have submitted the text to the Venice Commission for an opinion which shall be delivered by the end of 2017. // After the collapse of the USSR, the territorial sovereignty of Ukraine, as an independent state, was recognized by the international community: both the UN and Russia. Additional details: What is happening now, and in principle in the last decade in Ukraine, reminds a historical period of “Ruina" [ruin or devastation] in Ukraine from 1657 to 1687. After the reunion with Russia, real ruin and chaos began in Ukraine. No evidence of the “complete devastation” in Ukraine today. The GDP of this country increased by 2.4% in the second quarter of 2017 comparing to 2016. Ukraine's gold and currency reserves reached US $ 18.6 billion in September 2017 (in 2014 - US $ 7.5 billion). Read more about the prolonged state of chaos that contemporaries called “the Ruin" here. Ukraine is an artificially created structure that cannot function independently without the West. Additional details: Ukraine is an artificially created structure. It cannot function independently. It retains its territorial integrity only and exclusively because it is needed by the Western orderer as an uncomfortable neighbor for Russia. Recurring disinformation. Ukraine is a legitimate state with a legitimate government recognized by all the the UN members and functioning due to the democratic President and Parliament elections held after in 2014. Additional details: Memorandum of Understanding between the Ministry of Industry and Trade of the Czech Republic and European Metals Holdings Limited in the field of mining and processing of lithium in the Czech Republic establishes an irrevocable commitment to protect the Australian´s investments, liabilities and costs, which Australian company had, has, or will have in terms of lithium mining in the Czech Republic. BlackRock Group, Evy Hambro, Craig Phillips, Hillary Clinton and the whole army of layers are ready to impoverish the Czech Republic in arbitration.